Costa Rica’s Top 10 Attractions rightly deserve to be on the spotlight yet alongside world-renowned highlights like the spectacular Arenal Volcano, verdant Manuel Antonio National Park and the ethereal cloud forests of Monteverde, Costa Rica hides innumerable hidden secrets. 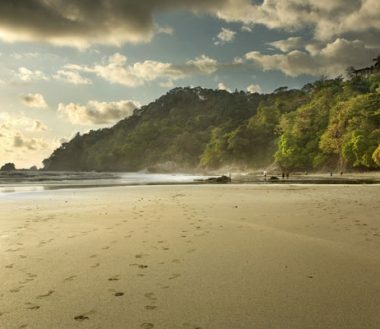 From unknown paradise islands to lesser-visited national parks, uncrowded natural thermal pools and sensational whitewater rivers that pack a huge adrenalin punch but no tourist crowds, the Seven Secret Wonders of Costa Rica open up a whole new, off-the-beaten-path world for those who make the effort to explore further. We love that these natural, uncrowded pools are right next door to the country’s most famous spring spa resort. It just goes to show that you needn’t travel that far to find Costa Rica’s many hidden secrets. The Pools of the Poor are a challenge to reach (which is unarguably what keeps the crowds at bay) but the short but steep trek is certainly worth the effort. Known for its challenging currents, these pools are not just outrageously beautiful but also very thrilling. A gorgeous little island only accessible from Montezuma at low tide, Isla Cabuya – known locally as Cemetery Island – is a snorkeling haven, its rocky shores inhabited by a wealth of colorful exotic fish. According to local lore, this burial island is haunted by ghosts and, if you’re lucky enough to visit on an evening when a funeral is being held, it’ll certainly feel spooky. Cabuya is actually well-known in the area but given its remote location – off the southern tip of the Nicoya Peninsula – it simply doesn’t see the crowds found elsewhere. Plan to spend a whole day, bring snorkel gear and a backpack full of snacks and explore this fascinating isle and its crystalline waters. Read more about Isla Cabuya. 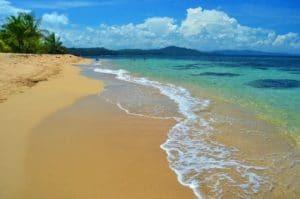 The Caribbean Coast is undoubtedly the lesser-visited in Costa Rica and, even among this long stretch of amazing beaches, there’s a secret little wonder that’ll get you away from it all. Punta Uva is revered locally for being the release point of the endangered green macaw, once native to the area and now reintroduced to the wild after a successful breeding program. This place is heaven – not just for the macaws – but for anyone who makes the trek to reach it. We’re talking long stretches of glistening sand, turquoise waters, coral reefs close to shore and about as postcard-perfect a setting as you could ever find, anywhere on earth. If pirates found this bay to be the ideal hiding spot, it’s no wonder those who stumble upon it rate it so highly. If it were anywhere else, Pirate Bay would be swarming with tourists but given its out-of-the-way location in the north of Guanacaste’s coast, it remains a secret wonder discovered by just a handful of visitors. Boasting a very long stretch of pink-sand beach, this glorious spot is ideal if you’re looking for a quiet spot to laze about for the day. There’s loads you can do here if you’re feeling energetic though, with paddle boarding, kayaking, snorkeling and even horseback riding excursions on offer from nearby Playa Conchal – which is exceptionally beautiful but also very crowded. So head to Bahia de los Pirates to get away from the crowds! Easily accessible and endlessly idyllic, Chira Island is not the most secret spot in Costa Rica but considering that much of the island is wild, brimming with incredible wildlife and unexplored, it certainly feels like a hidden secret when you’re actually there. Three small villages are all you’ll find here with just a handful of family-run lodges and great eateries that’ll make you feel like you’re a world away from the mainland. This is one of the best eco-tourism spots in the Gulf of Nicoya and locals are committed to leaving this place as natural as can be. Most visitors just head over for a day trip from Puntarenas so if you really want to enjoy it thoroughly, stay a few nights and spend your days exploring Chira on foot and by mountain bike discovering slat pans, mangroves and stunning forests. We know you’ll absolutely love it. Savegre is one of our very fave spots and our trusted recommendations for guests looking for Costa Rica honeymoons off the beaten path. It may be in one of the most visited provinces at all but Savegre and its sensational river and jungle are blissfully remote. The rain forest is home to tapirs and jaguars, vibrantly-colored parrots, ospreys and egrets, and the Savegre River, to cap it off, is considered one of the best adventure vacation spots in Costa Rica, offering rapids class II and III among its endless acres of pristine wilderness. This is the kind of place you’ll want to get totally immersed in for a few days to really soak up the wild delight of the country. Crazy name and an even crazier spot, this tree-house lodge is absolutely unreal and by far one of the best secret wonders of Costa Rica. Eco-friendly and immensely enticing, this Manzanillo gem immerses you in the heart of its wilderness and as long as you’re not a sleepwalker (gasp!) you’ll absolutely cherish your overnight stay. 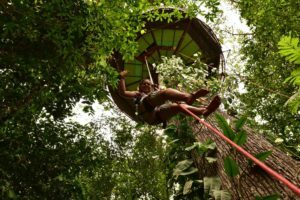 This unique place markets itself as a 3-in-1 experience, where you can hike in its prime rain forest full of exotic creatures, hoist yourself up to the wildlife observatory (actually easier than it sounds) and, finally, spend a night amidst the treetops. An exhilarating experience and a secret spot that’s not to be missed. Nestled between extinct volcanoes and nearby some of the most spectacular waterfalls in all of Costa Rica, Bajos del Toro is one of the most surprising secret wonders of all. How on earth this place doesn’t feature in all the top-10-must-see-guides we’ll never know. The town itself is laid-back and lovely, with chances for hiking and waterfall chasing keeping the few visitors totally captive for days on end. The Cataratas del Toro rates as one of Costa Rica’s most magnificent, plunging powerfully down a sheer rocky cliff into an emerald pool. Take a heart-pumping hike around the pool and explore the surrounding forests, looking for wildlife. Only an hour and a half’s drive from San Jose, Bajos is a true wonder of Costa Rica’s wilderness. Just next door to Arenal but overlooked by so many, Rincon de la Vieja is where we head to get away from the crowds and enjoy some truly sensational hiking. The volcanic peaks, mud springs, sulfur hot springs and array of challenging and easier hiking trail offer a wealth of options for those who love this rea (or are staying close by) but want to hike in peace and quiet. Still a hidden spot, after all these years, Rincon is a real gem not to be missed. Avid cavers head to Barra Honda from all over the world to explore its complex cave system yet outside this dedicated circle, the place receives little air-time. Great news for you! Head here with a dedicated guide and you could be plunging 700 ft into the Nicoya’s underground, exploring the limestone caverns dotted with otherworldly rock formations. This maze of caverns is said to consist of more than 40 separate caves yet in order to keep the area pristine, only 209 have been explored and only one is open to the public. If you’re into caving, you’ll enjoy reading our guide to Costa Rica’s Hidden Caves. 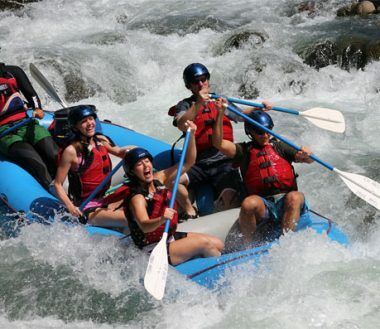 The National Geographic named the Pacuare one of the world’s best whitewater rafting and kayaking rivers and here at Costa Rica Rios, we couldn’t possibly disagree. This is our playground, our corner of paradise and our favorite spot to frolic with paddles. Despite its illustrious tag, the Pacuare and its surrounding jungles remain uncrowded, given the remote location and the fact this river offers multi-day adventure tour options but your average Costa Rica tourist only wants to get wet n’ wild for a single day. So most tourists stay on the west, leaving this incredible paradise uncrowded for the active explorers and adventurous spirits, those who want to get totally lost in the wilderness on the adventure vacation of a lifetime. 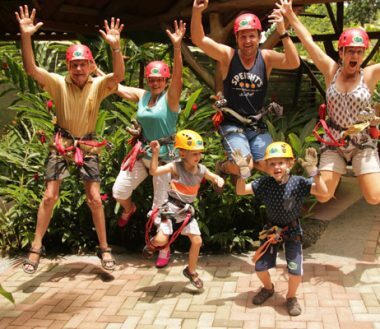 Our own secret wonder of Costa Rica really is the country’s best adrenaline rush! Costa Rica Rios – your adventure travel specialists and lover of all things hidden and secret. Check out our stellar ADVENTURE VACATIONS and contact us to book your next vacation to the most exhilarating country on earth!